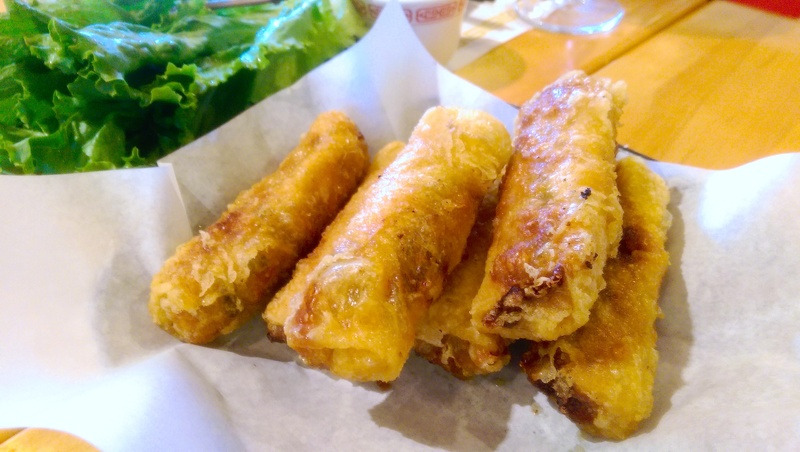 A must-order item at Vung Tau are the Vietnamese egg rolls, which the Southern Vietnamese call chả giò (minced pork sausage) and the Northern Vietnamese call nem rán (fried roll). I’ve got to get it everytime I go there! Vietnamese egg rolls aren’t made the same way as the Chinese or Filipino egg rolls. It is also not to be confused with ‘spring rolls’ (gỏi cuốn or nem cuốn). The wrap used is different; it’s made of rice paper instead of flour. The rice paper makes the rolls light, airy, and very crispy. I loooooooove ’em! Many Southern Vietnamese restaurants serve chả giò with lettuce, an assortment of leaves, and nước mắm (fish sauce). You can eat chả giò by itself, but it’s traditionally eaten as a lettuce wrap (with or without the leaves), then dipped in nước mắm. After a bite into it, you can see the ingredients used inside the chả giò. Vung Tau’s chả giò contains shredded pork, black fungus, carrots, and rice vermicelli. Each restaurant may have a slight variation with the filling/stuffing. Yum! This makes me want to go back for some more right now! The main structure of a roll of chả giò is commonly seasoned ground meat, mushrooms, and diced vegetables such as carrots, kohlrabi and jicama, rolled up in a sheet of moist rice paper. The roll is then deep fried until the rice paper coat turns crispy and golden brown. The ingredients, however, are not fixed. The most commonly used meat is pork, but one can also use crab, shrimp, chicken, and sometimes snails (in northern Vietnam), and tofu (for vegetarian chả giò– ‘chả giò chay‘). If diced carrots and jicama are used, the stuffing is a little bit crunchy, matching the crispy fried rice paper, but the juice from these vegetables can cause the rolls to soften after a short time. If the rolls are to be stored for a long time, mashed sweet potato or mung beans may be used instead to keep the rolls crispy. One may also include bean sprouts and rice vermicelli. Eggs and various spices can be added to one’s preference. Sometimes, the ingredients can include julienned taro root and carrots if jicama cannot be found. Taro roots give it a fatty and crunchy taste. The most interesting part in nem recipe is that it varies on different families and also different regions of Vietnam. No recipe is official. It depends on the custom of eating of each family. Therefore, in some ways the chả giò made by the wives show their cares for their own family. There can often be confusion as to what exactly is meant by nem depending on the circumstances. In Vietnam, there can be confusion between northerners and southerners because northerners tend to use the term nem to refer to a variety of rice paper rolls, including gỏi cuốn (often referred to in western restaurants as “salad rolls”). The southerners, however, tend to adopt a more narrow definition of nem. Further confusion can occur outside of Vietnam because the English translation of chả giò varies according to restaurants’ menus, chả giò is often confused with other dishes such as egg rolls or salad rolls. As chả giò made with rice paper can easily be shattered when fried, and also stay crispy for only a few hours, restaurants outside of Vietnam have adopted wheat flour sheet to make chả giò, in place of rice paper, thus blurring the difference between chả giò and the Chinese egg roll.